An outpouring of community and corporate support bolsters plans to rebuild the beloved Jamie Bell playground. 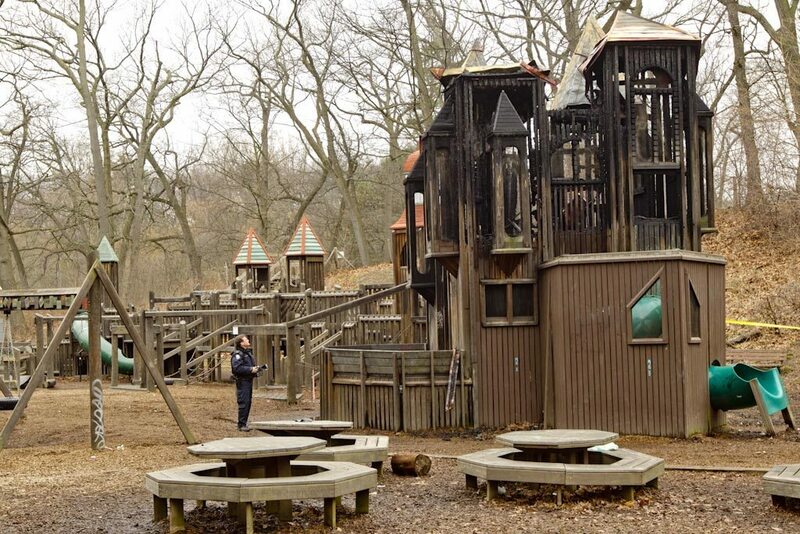 A fire that police believe was set deliberately inside the wooden castles of a beloved High Park playground has elicited anger and shock from the surrounding community. But the desire to rebuild is just as strong, according to Councillor Sarah Doucette (Ward 13, Parkdale-High Park). “If we were to set them a date, I’d have an army of people there wanting to help, to actually build,” she said. The Jamie Bell Adventure Playground was built in 1998 by a team of community volunteers, and several members of that original group have expressed interest in assisting with the rebuild. Offers to donate money and labour are also pouring in from the community. Canadian Tire has pledged $50,000, and other offers from corporations are expected to be announced in the near future. Firefighters, unions, and construction companies have come forward to donate supplies and provide volunteers. The majority of funds for the original structure came from community donations. The details of the reconstruction—its cost and timing—are still being worked out, and police are investigating the fire as arson. Yesterday, park workers removed a top metal piece that was in danger of blowing away. The burned area was fenced off on Sunday morning to allow staff to open up part of the playground for kids to enjoy on their last day of March break. The original designer of the playground is on board to re-conceive the structure and possibly add new features. “This is an actual chance to tweak it a bit,” said Doucette. “You never know. If we raise a lot of money we could add an extra feature.